God, help me be a wise person of few words. When I do speak, let them be the right words at the right time. My wife is my medicine. She has a cheerful heart and I praise God for that. lol. I actually did a search for “shhhh” and this was one of the photos that came up. 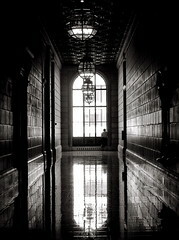 I immediately liked the photograph and it had this contemplative, quiet quality to it. My post was more of a contemplative thought/prayer about being quiet, so I used it. What was the connection you made between the topic and the photograph?